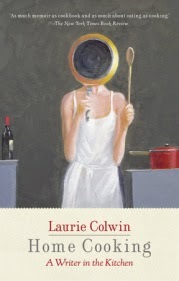 Home Cooking: A Writer in the Kitchen (Vintage Contemporaries) by Laurie Colwin. Illustrations by Anna Shapiro. Personal copy: Vintage, 2010. Originally published in 1988. It's About: Part memoir, part cook book. The Good: I read Colwin's Happy All the Time around when it first came out -- and it's stuck with me all these years. Since I was only in early high school at the time I read it, I thought that Happy All the Time, and Laurie Colwin herself, was my book, my discovery. While I bought a new copy when Vintage did its 2010 reissues, I still haven't brought myself to read it: would it be as perfect as I remember? Would it be as meaningful? For how I read then, in high school and later, and well, for various reasons, despite loving that book I didn't read other Colwin titles. The good news about that is that now I can read them. Home Cooking is a like a wonderful visit with a friend, making dinner and having laughs with a bottle of wine. It makes me hungry from the recipes; it makes me feel capable, because Colwin presents them as if they were easy to make. Her first kitchen, her first resources, are small and simple, making it that much more accessible to any reader. There's also an emphasis on fresh ingredients - seriously, it's as if were written today. I also want to track down a copy of The Taste of America by John and Karen Hess. "Some diehards feel that to give a dinner party without a starter is barbaric. Mellower types want to get right down to the good stuff and not mess around with some funny little things on a small plate. Some hosts and hostesses are too tired to worry about a first and a second course and wish they had called the whole thing off." "After you have cooked your party dinner six or seven times, you will be able to do it in your sleep, but your friends will be bored.You will then have to go in search of new friends..."
I now have to read More Home Cooking: A Writer Returns to the Kitchen -- but I don't want to, not yet, because I still want to be looking forward to reading it. Laurie Colwin: A Confidante in the Kitchen by Jeff Gordinier, The New York Times; "there is something about her voice, conveyed in conversational prose, that comes across as a harbinger of the blog boom that would follow." Decades Later, Laurie Colwin's Books Will Not Let You Down by Maureen Corrigan, NPR. Because my "favorite books" list is about when I share it on the blog, not when it was published or when I read it (technically, this was during vacation last September), this is a Favorite Book of 2015.